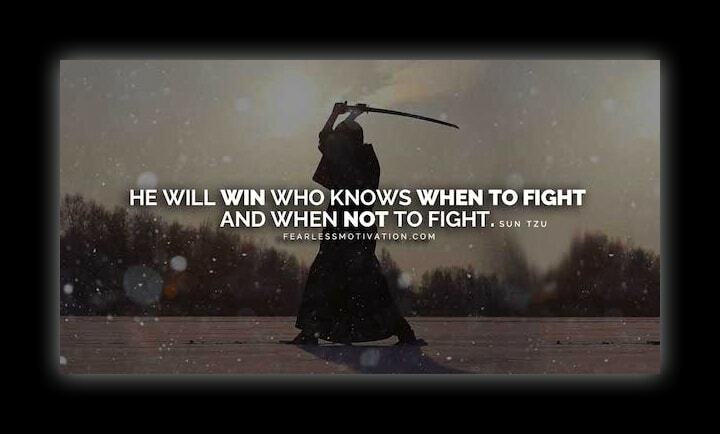 Sun Tzu was an ancient Chinese military general, strategist and philosopher. The Art of War has been the definitive text on military strategy and warfare ever since being written in ancient China around 500 BC. Since its translation, generals across the world have understood and used the principles. Their defeated opponents chose to ignore The Art of War. 1. The supreme art of war is to subdue the adversary without fighting. 2. Only enter battles you know you can win. Avoid battles you cannot win. 3. Keep your plans, strategy, tactics, and decisions as dark as night. 4. Decisions based on any level of emotion will lead to defeat. 5. Lead your team as if you were leading a single man by the hand. Some lawyers, “bulldog lawyers” love to fight for the sake of fighting. Fighting is just an impulse that some cannot control. Sometimes, fighting satisfies the anger, hate, and/or resentment of their clients or alleged victims. But, making decisions based on emotion, particularly anger, will almost always lead to defeat. The successful lawyer wins without going to battle. While this is not always possible, there are many techniques and tactics we employ to seek a win without exhausting resources and putting clients at risk when they face 12 jurors. Have you ever thought about the fact that the most skillful generals often avoid battles. This tactic is what gave rise to nicknames like “The Desert Fox”, “Grey Ghost” and the “Swamp Fox.” That is why they’re rarely defeated. They choose the army, field, and time of battle. They are in control of the situation. They only attack if they can win. Making the proper decision here requires analyzing information, evidence, and the people involved. We also discuss strategy with a small group of trustworthy and talented prosecutors and defense attorneys. While this process can be lengthy, patience is our greatest warrior. Strategy and tactics should almost always be hidden to some extent. This is not dishonesty. Some prosecutors we deal with are close and trusted friends. But we all know that when war (trial) is approaching, we will be ready with a strategy that may change throughout the case. Protracted warfare is to be avoided. Patience is our greatest warrior. Truthful information about every aspect of a criminal case is critical laying plans. In the practice of criminal law, we do the same. For example, sometimes a lawyer will be engaged with another who is arrogant, overconfident, and/or underestimates his adversary. This is the perfect scenario for the other lawyer. Rather than “prove your worth” beforehand or reveal how smart you think your plan is, you should always appear as your adversary believes. Feed his arrogance. Let him know you have no chance. There are endless examples like this one in the practice of law. Be humble, modest, and listen to your adversary brag about his strategy, facts, and goals. He will reveal more than he ever intended. Our firm is a growing team. This leads to a more complex organization that must be managed properly in order to function as one. Every single team member adds thoughts, ideas, and solution based suggestions to Swindle Law Group, and all of those have to be managed. To do this, SLG breaks our team down into smaller groups and then use clear signals to steer them into the right direction. Teams should stay small and tasks should be clear. For instance, when we review evidence, three small teams perform the task. The law clerks review first, then an associate lawyer, and then lead counsel. Sometimes, we ask a friend who is not a lawyer to watch and interpret videos so that we also have the perspective of someone who would be most like a juror. Then, lead counsel can send clear signals and tasks to team members as our team becomes one in each case. Each lawyer at Swindle Law Group keeps in mind that 1-on-1 interaction with everyone on the team is critical because if you treat your employees like family, you will earn their loyalty.